A few months back I spoke with Regina Magazine about the importance of the liturgy. Regina is an excellent E-magazine that lives up to its slogan: Inspiring. Intelligent. Catholic. Check out their website (here) and consider subscribing to their free quarterly magazine. The following interview is re-posted with their permission. Q: For centuries, the Liturgy was considered a matter for specialists, mostly clergy. Why (do you think) the Liturgy is so important to ordinary Catholics today? I think there are two primary reasons why the laity today finds the Liturgy so important: exposure to poor liturgy in the past and access to information via the internet, television and print. First, I would focus on poor liturgy. 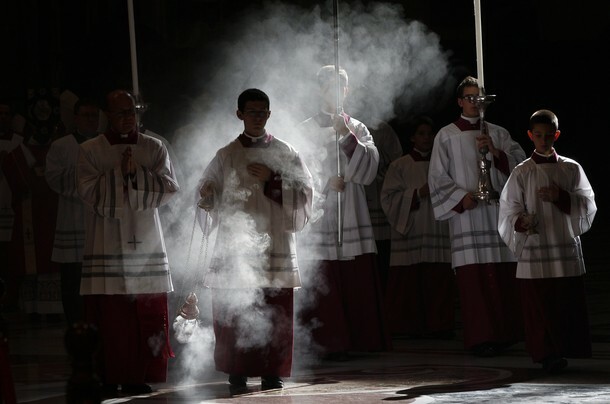 For decades many Catholics have been subjected to liturgy largely devoid of beauty or reverence. As a convert myself, it is clear that in many parishes the Mass has been treated very much as a communal worship service, devoid of its inherent Catholicism. As a relatively recent convert, I would argue that the ongoing “reform of the reform” that our Pope emeritus so often referenced has been embraced by many clergy and laity alike. Further, as we have seen the Traditional Latin Mass become more widely available to the faithful following Summorum Pontificum, the lay Catholic now has more opportunities to participate in sacred and beautiful liturgy. In addition, our holy priests who offer both forms of the rite have increased the reverence in the Novus Ordo Mass, highlighting our liturgical heritage and continuity. For so many Catholics today, once you have seen the Mass offered in such a manner, it becomes difficult to tolerate the casual, Protestant service, approach that was so prevalent for years. Secondly, I believe that media such as the internet, television and print has provided the ordinary Catholic with the history, tradition, theology and (most importantly) the imagery of what the Holy Sacrifice of the Mass always was, and once again is becoming. Websites like New Liturgical Movement, publishers like TAN books (in my hometown of Charlotte) and Ignatius Press, the writings of Ratzinger, Gamber and Nichols (along with those from the past such as Gueranger and Fortescue), and even You Tube with so many clips of beautiful masses have all contributed to the collective formation. There has been quite a bit of self-catechizing going on with regards to the liturgy. I don’t know if we would have seen the exponential growth of the Latin Mass in America, recently covered in a great piece in Regina Magazine, if we didn’t have the Internet and social media such as Facebook to bring people together. The traditionally minded Catholic discovered that they were not alone in their love for the Mass. Q: Tell us something about yourself, and how you found your Faith. I grew up in Los Angeles in a largely irreligious family. I have an aunt who would often scoop up my brother and I and take us to non-denominational Christian churches. Eventually in my early twenties I began attending a Missouri Synod Lutheran Church, which is of course liturgically oriented, recognizes two Sacraments, follows a liturgical calendar, etc. My wife is a cradle Catholic who, at the time we met, had somewhat fallen away. It was the birth of several children and the convalidation of our marriage in the Church in 2005 that set the stage for my conversion. Once we moved to Charlotte I immediately began RCIA, with my wife as my sponsor. I would say that I largely read my way into the Church. I had to intellectually grasp the faith before it could work its way from my brain down to my heart. I was confirmed at Easter 2006 and have continued to grow in my love for our Lord and His Church since. Q: People say ‘Lex orandi, lex credendi’ — do you believe this is true? If so, how do the issues surrounding the Liturgy today affect Catholic belief and identity? Several years ago I first heard the Latin expression, “lex orandi, lex credendi” which translates to the “law of prayer is the law of belief”. To paraphrase, how we worship is how we believe. Added to this sometimes is “lex vivendi” which completes the thought; how we pray is how we believe which is how we live. We know from St. Matthew’s Gospel that our Lord teaches us, “You shall love the Lord your God with all your heart, and with all your soul, and with all your mind. This is the great and first commandment”. The Mass is the liturgical prayer of the Church. Defined, liturgy is simply a prescribed form or set of forms and rituals for public religious worship. How we worship affects what we believe which then influences how we live. There is a uniquely Catholic way to worship. A traditional and reverent liturgy which is unabashedly Catholic, far from being optional, is actually a necessity for imparting the faith. I would also argue, much like Cardinal Raymond Burke has, that we do not succeed at the New Evangelization if we do not “get” the liturgy right. From a catechetical standpoint, an understanding of why we worship and how we worship helps to form us as Catholics. What we believe, from the centrality of Christ in our lives to His real presence in the Eucharist, can either be reinforced by beautiful liturgy or done serious harm through the desacralization of the Holy Mass.